Begin by washing the clams and mussels well in cold running water. In a hot pot, pour in the wine, allow to boil for 2 minutes to get rid of the alcohol. Add the shallots, thyme, bay leaf and water. Bring the liquid back to a rapid boil and add the Clams and Mussels. Cover the pot and continue to boil until the shellfish are all open, about 2-3 minutes. Remove from the heat immediately and strain the liquid into a container or bowl. 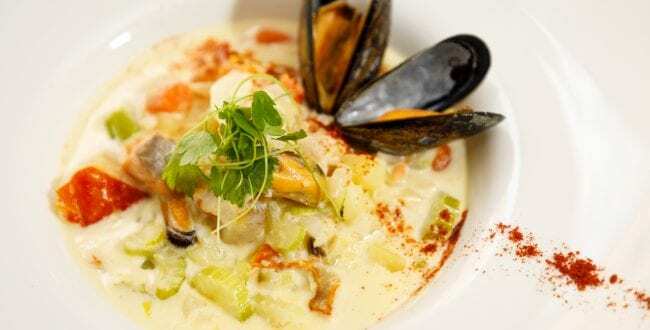 Before adding this stock to your chowder it’s a good idea to pour it through a fine sieve or cloth. Allow the shellfish to cool a little before removing them from the shells, discard any that are unopened. Set the meat aside to add to your chowder later. In a large Pot melt the butter over a moderate heat. Add the chopped thyme, onions, celery and carrot and season. Turn these vegetables over for a few minutes. Now add both stocks , bring this to a simmer and add the potatoes, simmer for a further 10 minutes or until the potatoes are cooked. Now add the cream and a little squeeze of lemon, just to taste before adding the diced fish and the mussel and clam meat you set aside earlier. Simmer for a further 2-3 minutes before serving. Garnish with some freshly chopped parsley, a pinch of cayenne and a prawn if you wish.